Our brown marmorated stink bug distribution map has been updated. Minnesota, Wisconsin, and Illinois have reported agricultural problems, and Arkansas has newly reported nuisance problems. March 12, 2019 Samurai Wasps Say, "Smell Ya Later, Stink Bugs"
Scientists are investigating a new tactic in the war on the brown marmorated stink bug: the possibility of relying on one of the bug’s natural enemies, the samurai wasp. Watch this video for a close-up view of stink bugs and samurai wasps in action. Source: KQED “Deep Look”, Mar. 12, 2019. Our map of field recoveries of Trissolcus japonicus has been updated with 2018 findings. Also known as the “samurai wasp,” Trissolcus japonicus is an egg parasitoid and a key natural enemy of brown marmorated stink bug. Download presentations from the BMSB Stakeholder Advisory Panel Meeting, held February 19, 2019. In the latest issue of American Entomologist , a team of scientists tells their story about how they sprang into action to investigate natural enemies of the brown marmorated stink bug. Source: Entomology Today, Dec. 17, 2018. 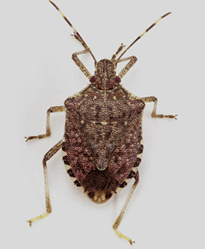 The brown marmorated stink bug—already the scourge of the Northeast—is also in Washington. And it might move in with you this winter. A WSU researcher is breeding tiny samurai wasps in an effort to fight the pests. Source: The Seattle Times, Aug. 23, 2018. August 9, 2018 Scientists Spent Years on a Plan to Import This Wasp to Kill Stink Bugs. Then It Showed Up on Its Own. The samurai wasp (Trissolcus japonicus) arrived by accident in the United States before scientists were ready to release it. Source: Science, Aug. 9, 2018. The brown marmorated stink bug, Halyomorpha halys (Stål), is a voracious eater that damages fruit, vegetable, and nut crops in North America. With funding from USDA’s Specialty Crop Research Initiative, our team of more than 50 researchers is uncovering the pest’s secrets to find management solutions that will protect our food, our environment, and our farms.